Well, this story starts yesterday afternoon. I went to Belmont North swamp and parked at Lenaghans oval on Wommara Avenue at Belmont North. 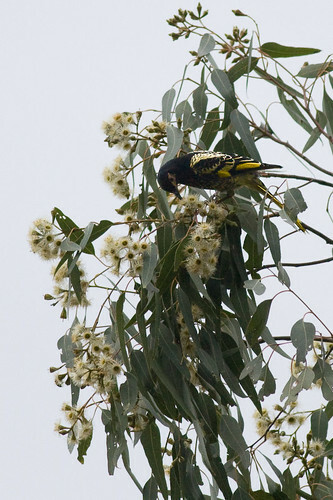 There were a bunch of Yellow-faced Honeyeaters in the flowering eucalypts and a couple of rainbow lorikeet. I followed this creek into the swamp but there was nothing much about. I followed the edge of the bush after that and saw only some Chestnut Teal and Australian Wood Duck in an artificial pond at some estate they were building. It was a major disappointment. I could not find my way into the middle of the swamp so that maybe better. I don’t know. This morning I went to Belmont Lagoon and wandered down Cold Tea Creek. There were a mob of Little Black Cormorants roosting on the wires as well as a Little Pied Cormorant and a few Spotted Turtle-doves. 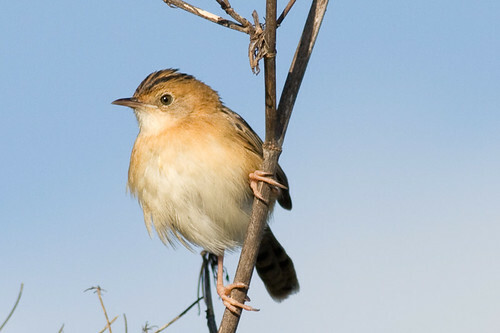 Further up in the reeds there were some Yellow Thornbill, Brown Thornbill, Superb Fairy-wren and Southern Emu-wren. I could not get any decent photos of the Emu-wrens as they kept behind the bushes and would not come out into the open. I was most disappointed. I turned right at the end of the creek and saw a heap of White-cheeked Honeyeaters, and some Crested Pigeons. 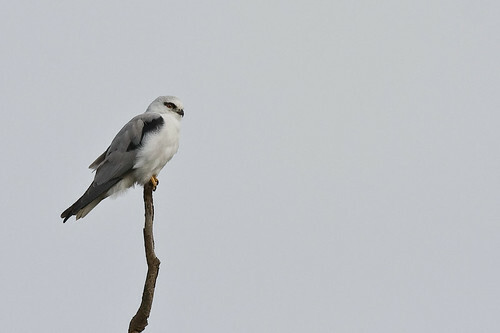 In the distance towards the beach, I saw a Black-shouldered Kite on a dead tree. I walked up the road to get closer, and ended up bashing through the bush to get a closer look at him. I finally got pretty close and got some lovely photos. 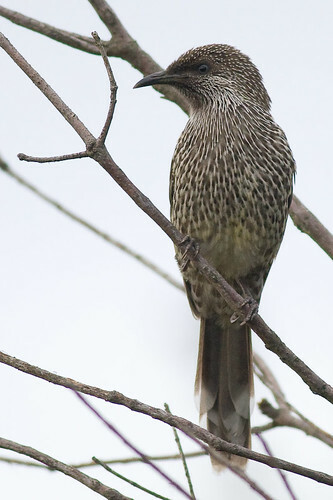 Wattlebirds and a pair of Striped Honeyeaters. 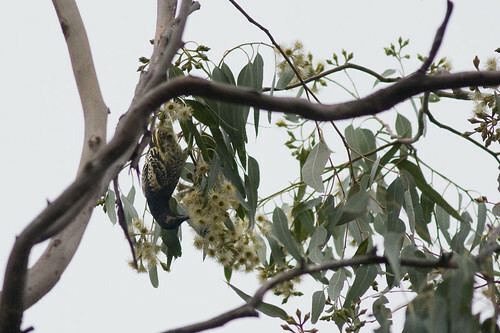 The wattlebirds were trying to get rid of the Striped Honeyeaters but they were having none of it. There was not much up the peninsula except some Black Swans. On the way back I saw a Nankeen Kestrel hovering near the sewerage treatment works. I went over and then say a hovering Black-faced Cuckoo-shrike, which was quite weird. I have seen a white-bellied Cuckoo-shrike doing the same thing. I must find out about this behaviour. 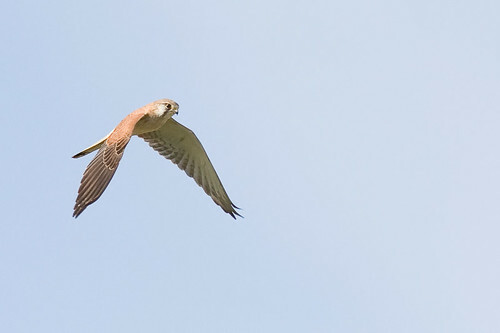 The Nankeen Kestrel came closer and was hovering quite close to me and I got some good shots. I was stoked. After that, I went back down Cold Tea Creek where I saw some Red-browed Finches and an Intermediate Egret, some Chestnut Teals and another Little Pied Cormorant. By this time my card was full and I had taken 8 gigs of photos. I havent had time to process them yet, so I will put them in here when I get them done. I had to write this up before I forgot it all. Edit: The photos have finally been edited. This afternoon I went out to Stockton Channel on the northern arm of the Hunter river. At first I went to the South East end of Kooragang Island to see if there would be any raptors flying past. 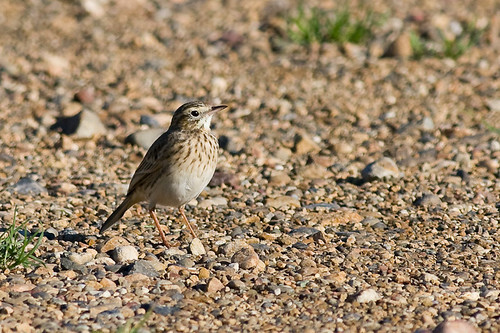 I saw none but there was an Australian Pipit on the road. Why do they always hang out on roads? There was a pair of Crested Pigeon feeding on some rubbish and a few beautiful Golden-headed Cisticola on the Aniseed bushes chirping away merrily. After that, I headed off to the other side of the channel and saw a Brahminy Kite roosting on a channel marker so off I scooted to the other side. It was a bit far away so the photos were not so good. 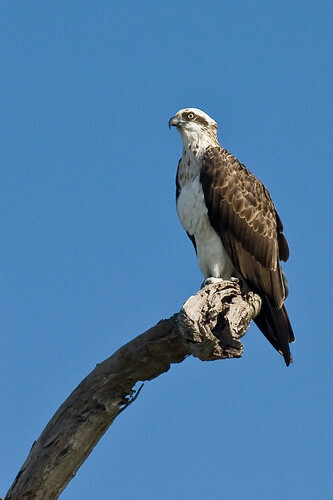 The Brahminy Kite flew off and went to the eastern side of the channel and I later saw him roosting in a mangrove tree. 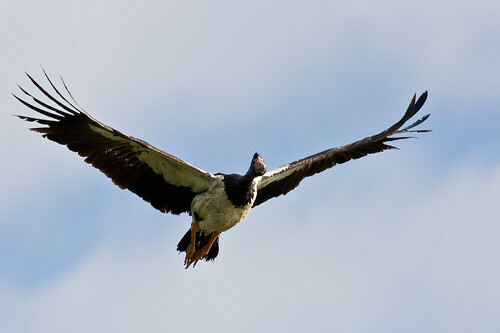 Later on I saw a White-bellied Sea-eagle circling around high above. I was wondering today if different species of raptor share a hunting territory. 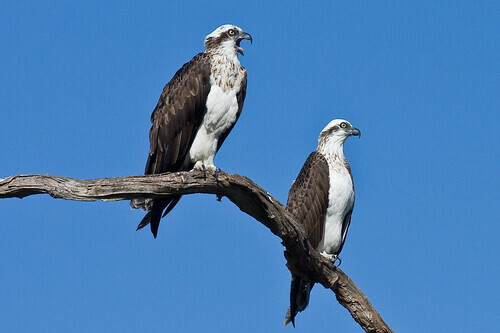 I have seen a variety of raptors in this area – White-bellied Sea-eagles, Osprey, Brahminy Kites and Whistling Kites. I went to the wreck but saw only a few Yellow Thornbills and a White-faced Heron roosting on the wreck. After that, I went to the Stockton Sandspit and saw some Australian White Ibis and a Royal Spoonbill feeding in the lagoon on the sandspit. 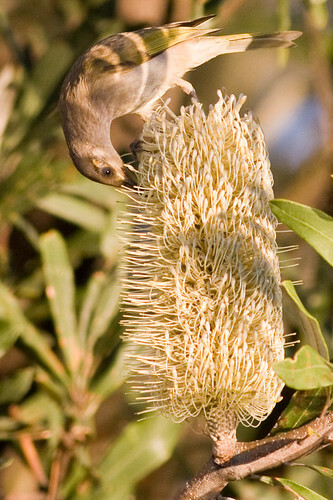 There were a few Brown Honeyeaters in the banksias at the southern end of the sandspit. 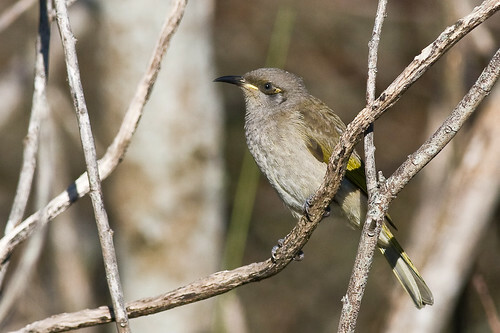 I have seen Brown Honeyeaters in mangroves and in banksias. I am wondering if that is their main habitat? New Members Day at Hunter Wetlands Centre, 21st June, 2009. Today was the new members day for the Hunter Bird Observers Club that was held at the Hunter Wetlands Centre at Shortland, Newcastle. 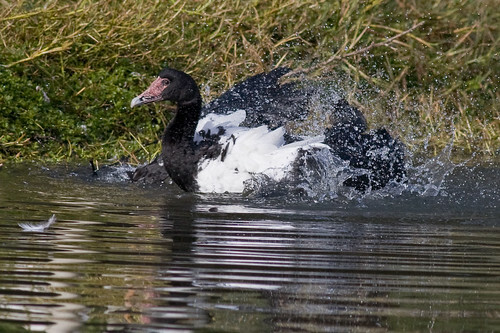 We set off around the main pond that had the usual water birds such as Eurasian Coot, Dusky Moorhen, and the ubiqitous Magpie Goose. This one came flying in with a few other ones. And this one was having a bit of a shake in the water. We wandered over to the other ponds and had the good fortune to see some Pink-eared Ducks and Australasian Shoveler (Anas rhynchotis) with their weird looking bills and orange legs. We also had the good fortune to see a Grey Goshawk (Accipiter novaehollandiae) flying past, being harrassed by a magpie. It was too far away for a decent photo, but we all got a good look at it and it was a first for me. 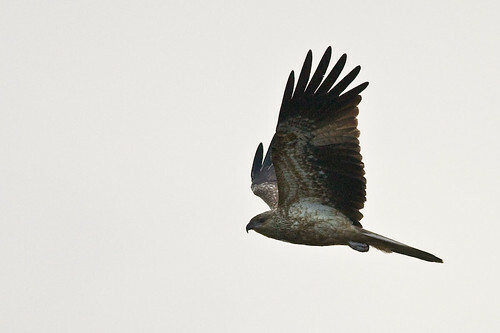 Further on, we spotted quite a few Whistling Kites, I saw at least three, but there may have been more. There are always a few of them flying around the wetlands centre. Further around towards the end of the breeding pond, we say a couple of Nankeen Night Herons and a Black-faced Cuckoo-shrike. Other people saw a Striped Honeyeater, but I could not find it. doh! There were a few honeyeaters that were feeding on the flowering melaleuca trees. 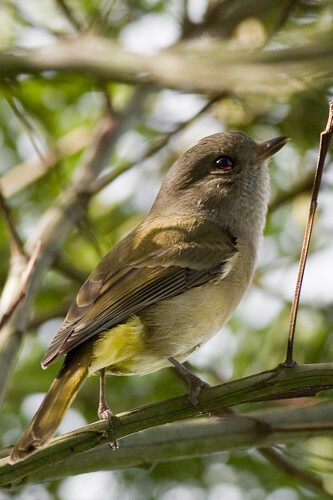 Mainly Yellow-faced Honeyeaters and White-cheeked Honeyeaters. This bird is a female Golden Whistler, I think. I was not sure because of the yellow under the tail and the reddish eye. Coming back near where the wooden bridge is, we saw a pair of Wandering Whistling Ducks and an Azure Kingfisher fishing. There were also three male Chestnut Teals who were displaying quite humorously and decked out in new breeding plumage. They looked very spiffy indeed, but their macho displays were rather comical. 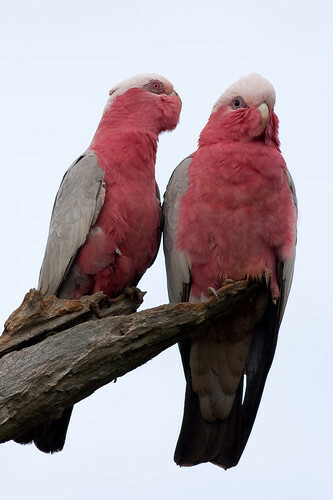 Here is a pair of Galah and I took this photograph to show the difference between the male and female. The female is on the left and is smaller and has a pinkish eye. I never knew that until yesterday. Well that was about it, except that we had a wonderful barbecue with sausages and salad. It was very yummy. Thank you indeed. Jewels Swamp 18th June, 2009. This morning I went along the old railway line that used to run from Jewels to Belmont. I parked where Kallaroo Avenue crossed over the old railway line at Jewels. It is just down the hill a bit from the intersection of Wommara Avenue and Kallaroo on the road to Redhead at Belmont North. See the spot marked “P” on the map. You can park at the other end of the track at the eastern end of George Street in Belmont. The old railway line used to run between Newcastle and Belmont Station on Railway Parade. It has long since been shut down and part of it now forms the Fernleigh Track which goes from Adamstown to Whitebridge. I followed the railway line from Jewels and saw some Superb Fairy-wrens at the start. Further along, there were lots of White-cheeked Honeyeaters. I crossed over the railway line to a sandy track that runs parallel to the train line. The scrub there is mainly Tea Tree Bushes on the sandy soil. Quite a few Little Wattlebirds were squabbling around in the Banksia trees that were scattered amongst the scrub. I also saw an Eastern Spinebill along here and heard quite a few Eastern Whipbirds calling out, but could not see them. I crossed back to the train line which is bordered on both sides by eucalypt trees. I saw more White-cheeked Honeyeaters, they seem to be the dominant bird species along the track. 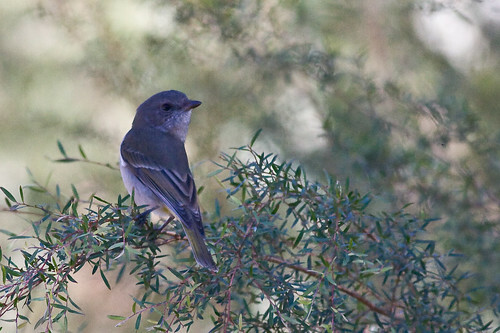 I also saw some Silvereyes, Grey Fantail and Yellow Thornbill. Half way between Jewels and George street, I turned off along the track to Belmont Oval. On the track I saw a Brush Bronzewing(Phaps elegans) near a puddle of water, and took a photo, but it was too far away and blurry. When I moved closer, it flew off. Further along towards the oval were a few Little Wattlebirds. I could not get across to the oval because there was a raging torrent stopping me at a creek. 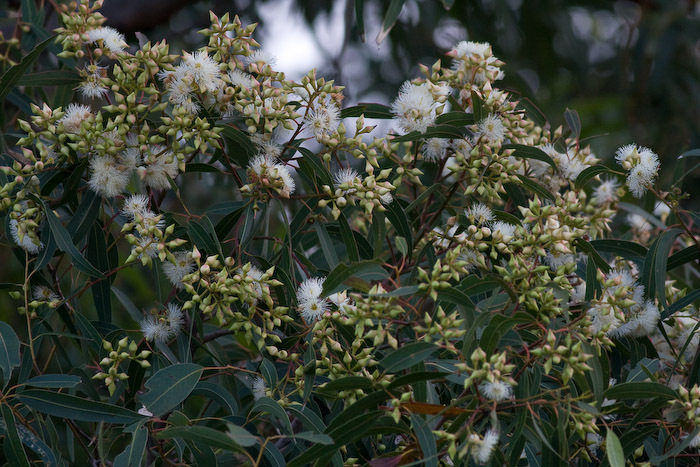 This is the flowers from a eucalypt tree that the honeyeaters feed on. I turned back towards Jewels when I got to the train line again. I could have gone right towards George Street, but I had been that far about a month ago, and had seen Scarlet Honeyeaters, Yellow-faced Honeyeaters and White-throated Treecreepers. I turned left back towards Jewels along the sandy track to the west of the train line. You could also take the dirt road which is on the eastern side of the train line. There is quite a bit of different habitat along this narrow corridor. Nearer towards Jewels I saw a White-browed Scrubwren. This morning I went to Stockton Channel on the Hunter River to look for raptors and to see if there were any Double-barred Finch at the Stockton Sandspit. Well, it turned out not to be expected, as per usual. Firstly, I checked out the boat ramp at Stockton and was just lazily looking out onto the river, when this Whistling Kite came flying by, looking for some breakfast. I hurriedly got out the camera, and just managed to get a few shots of him. The weather at dawn was looking fine and I thought it was going to be a nice sunny day. But some clouds were developing by this time, and it ended up clouding right over and raining by the time I got home. After that encounter, I had a look at the wreck and in the bay, but there was nothing around. I parked at the Stockton Sandspit and went for a walk around the beach. There were some Common Starling sitting on a tree, and on the beach, there were a few Pelicans, Ibis, and Chestnut Teal. I was hoping to see some Sacred Kingfishers, but there were none about. The beach at the river side was pretty quiet actually, so I went into the scrub at the southern end. There were a mob of Superb Fairy-wrens and a heap of Little Wattlebird that were flying around the banksia trees. I went over to the south east side of the bridge and saw some Double-barred Finch, but did not get any decent photographs of them. I saw a White-bellied Sea-eagle way out on the river and hoped he would come towards me, but he headed west away from me. It wasn’t such a bad morning. I got some good shots of the Little Wattlebirds, which I wanted all along. I need some better shots of the Double-barred Finch, but that will happen another day. Bird Photography at Werakata NP, Abermain and Pelton – 14th June, 2009. Today I went on the Threatened and Declining Woodland Birds of the Cessnock-Kurri Area walk led my Mick Roderick from the Hunter Bird Observers Club(HBOC). We met up at Jeffries Park in Abermain and headed off to Werakata National Park, where we walked along the Shiralee fire trail. We managed to see some honeyeaters such as Yellow-faced Honeyeaters, Yellow-tufted Honeyeaters and White-naped Honeyeaters. 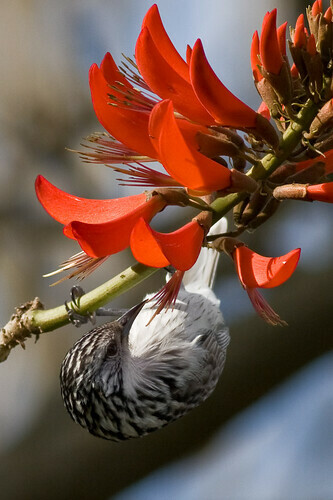 There were also a number of smaller birds such as Thornbills and Striated Pardalote. The highlight for me was seeing the Little Lorikeet, which I had never seen before. 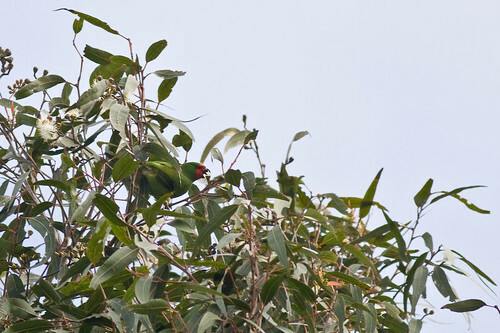 The Little Lorikeet is a proposed Vulnerable Species listing in New South Wales. They are considered to be nomadic and their distribution and numbers are related to the availability of food such as the flowering eucalypts, melaleucas, and mistletoes. The major threats to Little Lorikeet are the loss of breeding sites and food from ongoing land clearing. 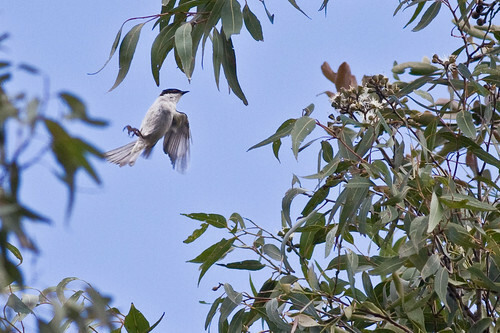 We also saw a few White-naped Honeyeaters. 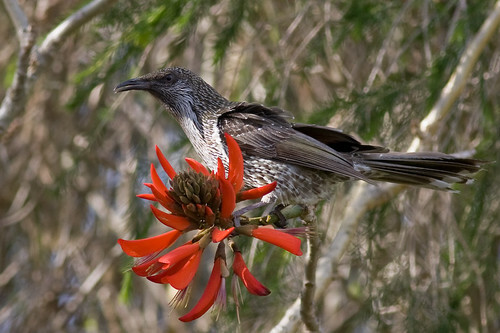 Their distribution is mainly the eastern part of Australia, and they feed mainly on nectar and insects. They tend mainly to forage in the tallest trees and and rarely seen on the ground. This bird does not know whether he is coming or going. We left the Abermain site, and drove through Cessnock along the Wollombi Road to Pelton. This is another part of the Werakata National Park and was formerly the Aberdare State Forest. There is a lot of garbage dumped in the bush around here, and lots of motor bikes racing around. Not a good look for what is supposed to be a National Park. We walked along the old train line to Boundary Road and down the gully and up again to a few stands of Spotted Gums and Ironbark trees that were flowering. We found what we were looking for – Regent Honeyeaters. They were high up in the trees, feeding on the blossoms. This chap was upside down. 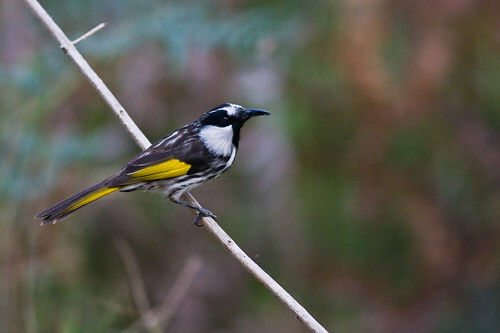 Regent Honeyeaters are listed as a Threatened Species and are seen as a “flagship species” for conservation in the threatened box-ironbark forests of Victoria and NSW on which it depends for its survival. 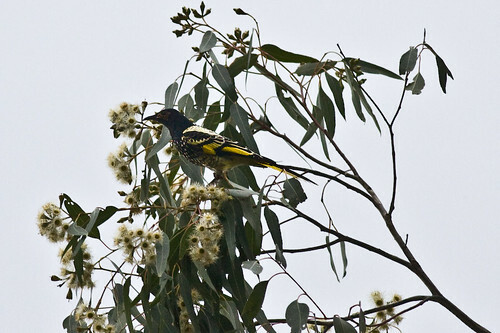 The Regent Honeyeater feeds mainly on nectar from a small number of eucalypt species, and acts as a pollinator for these same trees and other plants. Today only 25% of the original coverage of box-ironbox forests remain, mostly on less fertile soils, which are marginal habititat for the Regent Honeyeater. You and I can help to preserve these birds by protecting remnant woodlands in your community, leaving dead and fallen timber on the ground, supporting local conservation efforts such as landcare, and planting trees. Bird Photography at Morriset 13th June, 2009. This morning I went to Morisset State Conservation Area on the western side of Lake Macquarie. 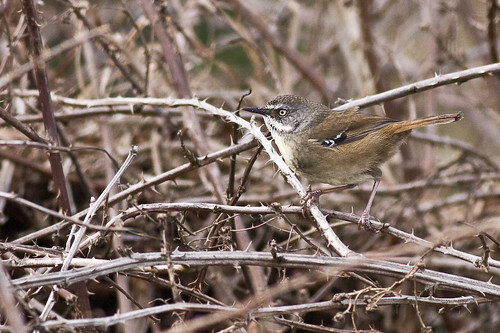 I walked around a paddock and found some White-browed Scrubwren fidgeting around in some blackberry bushes. They live in forested areas and eat insects and larvae. They are typically found feeding near the ground, in bushes. They belong to Order: Passeriformes and Family: Pardalotidae. I walked down along the road past the creek where I saw immature Golden Whistlers, race youngi, and Red-browed Finch. A Whistling Kite flew over, circling over the water. There were heaps of Eastern Rosella and Rainbow Lorikeet flying around in the trees and in the paddocks. A few Galahs were squwarking around the place as well. I kept on walking to the point that juts out into the lake. It was a great walk, but there were not many birds around except a couple of Magpies and Kookaburras. On the walk back I saw a pair of Ospreys perched on a dead tree. One of them flew off and then came back. 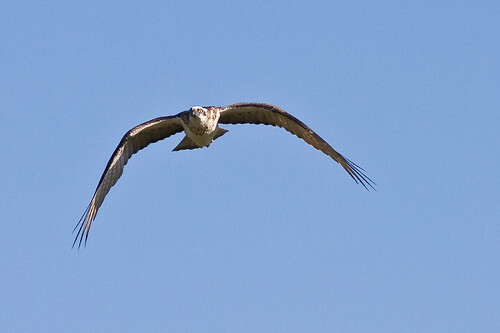 Ospreys belong to the Order: Falconiformes and Family: Accipitridae. 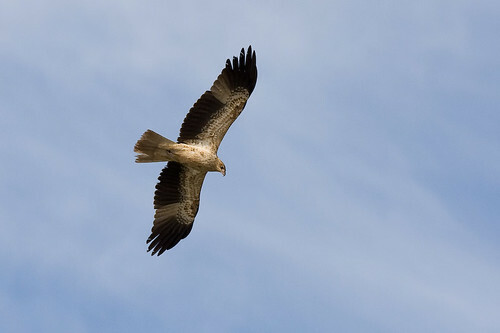 An immature White-bellied Sea-eagle was circling around the paddock, being harassed by some Australian Ravens, while an adult was roosting in a big tree. The Ospreys thought this was a big yawn. That was about it for the day. I waited around for the Sea-eagles to come back, but they did not. I was very happy to at last get some decent shots of Ospreys and was extremely satisfied with my morning’s photographic expedition. Bird Photography at Stockton Sandspit, 12th June, 2009. This morning I went to Stockton Sandspit to have a look for raptors. I found a couple but the shots were not that great, but I did see and photograph a Double-barred Finch for the first time, so I am happy about that. Yesterday I went out to the Stockton Channel at dawn and it was bitterly cold. It was absolutely freezing and the wind was howling a gale. It was so miserable, plus there were no birds at all around. I just went home. This morning was cold but I took a beanie and some gloves to fend off the icicles. I had a look at the boat ramp and the wreck in the northern Channel of the Hunter River. There were a few pelicans and seagulls but no raptors. I drove around to the Stockton Sandspit and went for a walk along the river side. There was the Pied Oystercatcher with one foot, an Australian Raven with half a loaf of bread in his bill, some White-faced Herons on the center grassy bit. Further on the beach there was a Whimbrel, a few Crested Terns and Gull-billed Terns, about 80 Bar-tailed Godwits, and a solitary Grey-tailed Tattler. I scouted around in the bush at the southern end of the Sandspit and spied a couple of Brown Honeyeaters. 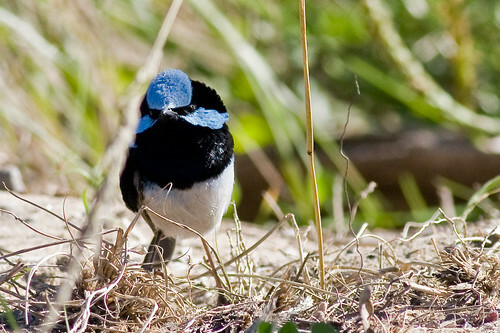 A mob of Superb Fairy-wrens were flittering around in the scrub and the grass. This pair were huddled up together and preening each other. It is a male and a female. They were quite cute. I walked out to the south-east end of the Stockton Sandspit and saw a White-bellied Sea-eagle wheeling about near the bridge. He straightened out and headed up Fern Bay to the north, looking for his breakfast. 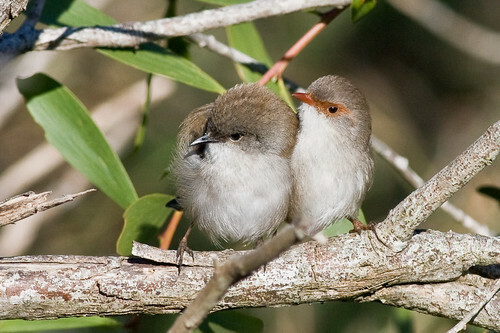 At the car park, the usual mob of Superb Fairy-wrens were mucking about. This popinjay was posing for the camera. What a ham! 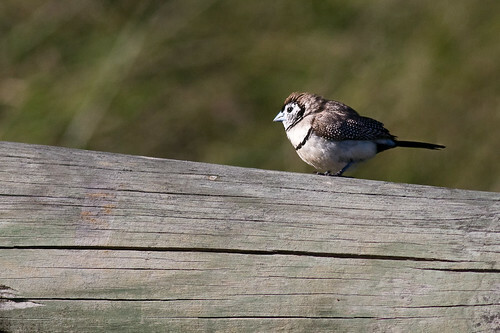 The strange thing was there was a Double-barred Finch sitting up on the fence railing with the Superb Fairy-wrens. I had never seen one there before, plus it was the first time I had seen one of these beauties. Bird Photography at Hunter Coalfields 10th June, 2009. This morning I took a drive past Kurri Kurri in the Hunter Valley towards Abermain. I had a quick look at the Werakata National Park at Abermain and then went along Hebburn Road. The weather was cold and very windy and not at all conducive to photographing or even seeing birds. There were a few Noisy Miners around and then I spotted a female Golden Whistler on a low bush. There was also an Eastern Spinebill and that was about it. I then drove through Cessneck past Bellbird along Wollombi Road and turned off at Ellalong Road and then went into the Aberdare State Forest along Pelton Road. Well it was not much of a road, only a muddy dirt track. The track turned into a clay bath so I parked my car along the side and walked. I got to boundary Road and went along it. The road was worse with major ruts and mud holes full of sticky clay. 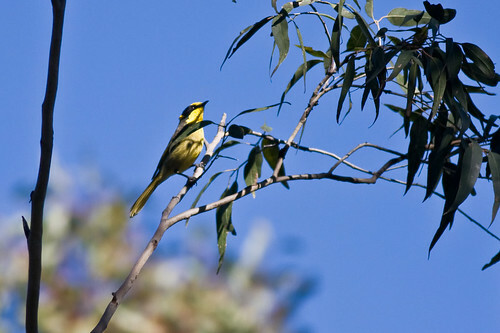 I walked along a bike track and then spotted a Yellow-tufted Honeyeater. I headed back down the track and then found an old railway track and then went along it looking for the Regent Honeyeaters that had been seen in the area. I did not see any but it is a terrific area and I shall be back soon. Well, on Sunday to be exact. Bird Photography at Galgabba Point, 9th June, 2009. On the way home from Canberra, I stopped in at Galgabba Point, at Swansea, on Lake Macquarie. 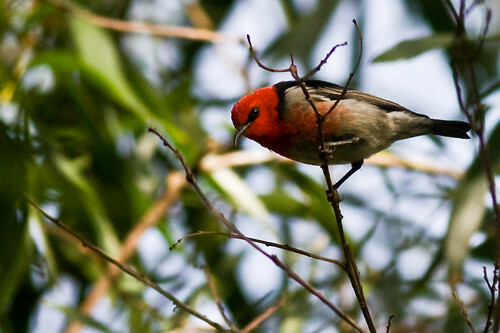 I wandered down the the track and there was a Scarlet Honeyeater, all primed up in his prettiest red, posing and primping away for the camera. There were a whole bunch of Yellow-faced Honeyeaters flittering around in the trees as well. The weather was horrid with cloudy overcast skies that made the light very nasty indeed. I think I was on ISO1600 most of the time. There were also a number of Lewin’s Honeyeaters in the undergrowth as well. This white-cheeked Honeyeater was carrying on like a prima donna, jumping up and down and flying in and out with a mouth full of insects. I kept walking down the track, past the Bell Miner colony. The Noisy Friarbirds and the Scaly-breasted Lorikeets were squabbling and chasing each other around. Out at the lake there were a huge amount of black swans and a few pelicans. As I got to the end of the point, I disturbed the immature female White-bellied Sea-eagle that I had seen a few weeks ago. I was not watching and me monkey mind was going round and round thinking rubbish. I need to pay more attention and keep my eyes open.